The Sculpting Process is Long and HOT!! Home » The Sculpting Process is Long and HOT!! 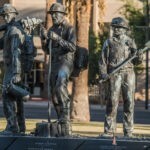 (Tucson, Arizona – May 2, 2017) Bronze sculpting has been around for thousands of years since the ancient Greeks and Romans ruled most of the modern world. As western civilization developed democracy, mapping the unexplored world, so was it making art. In major cities there were thousands of images of gods, athletes, politicians, and philosophers that lined the streets, temples and public areas. Most of these icons were also made into monuments made of bronze or stone. During that time a process, as we know today as ‘lost-wax casting’ was developed and is still being used in the present-day. 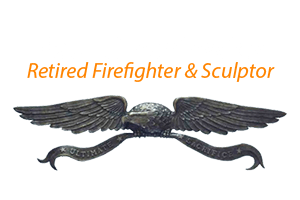 Paul Olesniewicz CEO and Artisan of 9-1-1 Sculpture runs’ his own sculpting business in Tucson, Arizona, where he continues to perform this art of ‘lost-wax casting’. Before contemplating the idea of making your own bronze sculpture or commissioning one. A person should understand that bronze sculpting is a long and delicate process from start to finish. Like making a movie there is a long and drawn out process that includes various techniques, materials, and equipment needed to complete the project. 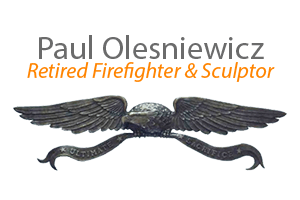 There are some foundries that have teams of artists to create multiple works of art, and there are smaller private groups like 9-1-1 Sculpture who work intimately with the customer. To break down the terminology for a minute, a foundry is a factory that produces metal castings. Bronze is heated 1900 degrees °F, then the liquid bronze is poured into ceramic shell molds. Once the molten metal is cooled down and ceramic shell is removed. Metalphysic Sculpture Studio is the foundry that Olesniewicz uses for his sculptures. First there is the original sculpture made by the artist, which is usually made out of wax, clay, or wood which ever the artist likes to work in. Second step is to make a mold of the sculpture. Then the inside of the mold is coated with wax to a thickness of 1/8” to 3/8”. Third, once the second wax sculpture is created, it is then coated with a mixture of ceramic material and silica sand to create a shell strong enough to withstand the superheat of molten bronze. Next is the Burnout Phase, the shell is then heated up to melt out the wax and leave the hardened shell behind. Almost there, the molten bronze is then poured into the casts, and cooled to solidify. Finally the bronze is sand blasted, welded together, and polished. One of the first questions that people ask are why does this cost so much money. Hopefully we were able to break down the reasoning for people’s inquisitions about purchasing a bronze sculpture. Not only do market based pricing for the materials of clay, wax, silicone, sand, and bronze come into effect, but also does the price of labor costs. In the United States a foundry worker typically earns a median salary of 32,182 USD. After the foundry worker is quoted for his pricing, then comes the artisans cost, (the person who created the original sculpture). Hundreds of man and woman hours can go into creating a bronze sculpture. Want to learn more? Here are some artists and their strategies for creating bronze sculptures. Brett Barney, President of American Fine Arts Foundry, leads an art company that houses many different artists that choose to participate in its program. If you are a sculpture but don’t have the large equipment required for foundry the AFAF will be happy to work with your needs. This is video was created by the Stan Winston School, which is a online video web course library for aspiring technical artists in the video and special effects world. 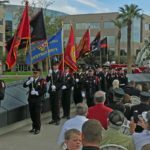 This video is presented by Matt Glenn the artist and CEO of Big Statues located in Provo, Utah.